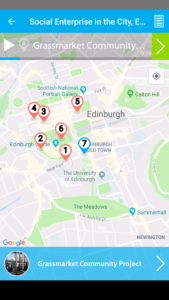 Geotourist and Invisible Cities’ new audio tour of Edinburgh will help visitors spend their money more positively while learning about social enterprise in the city. The project is a digital first, promoting responsible tourism, allowing visitors to explore the globally-popular city in a different way., introducing visitors to some of the city’s social enterprises as they take in the iconic sights and tell some of Edinburgh’s lesser-known tales. 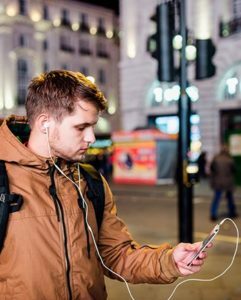 Put together by Invisible Cities – the social enterprise that trains people affected by homelessness to become walking tour guides of their own city – They will be receiving the donations accrued via the ‘Donate Now’ button on the Invisible Cities Geotourist audio tour. The Grassmarket Community Project which supports vulnerable adults and homeless people, operates a café and even creates a tartan for those that don’t have one. Invisible Cities is the regional winner of the Thistle Award for Innovation in Tourism and is proud to support Invisible Cities by combining storytelling and tourism to help promote social good. The tour offers visitors a way to get to understand the city that they are in beyond the traditional tourism message and offers travellers who champion responsible tourism an opportunity to leave a positive imprint that makes a difference to local lives. As well as checking out the Social Enterprise tour, visit Invisible Cities to book one of live tours in Edinburgh with one of their trained tour guides, with subjects spanning: Uncover Stories of Crime and Punishment; History of the Trainspotting Generation; Explore the Arts in Edinburgh.